A game about a cyber-sorcerer with a digital wand that overheats fast! Ranked from 30 ratings. Score is adjusted from raw score by the median number of ratings per game in the jam. Enemies functioning as keys: genius. For your first game, there's a level of polish I wouldn't have expected; transitioning from rooms Zelda-style is really neat. Too bad it's so short; there's some real mileage in the concept. Great work on your first Godot game, it runs pretty smooth :) The overheat twist you're using is a nice take on the "kill all enemies to open the door" gameplay, and I could see it used in several ways to create interesting puzzle shooter mechanics - but you did well to keep the scope small for this first game! Congrats on your first Godot project! Pretty cool game, reminds me of Gauntlet! The projectiles are supposed to hurt. They just aren't supposed to hit you right when you fire them. I liked it. The gameplay reminded me of Hotline Miami or Smash TV. 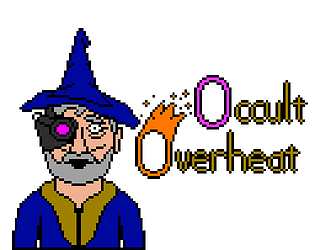 A Wizard shoot magic bullets at enemies and opens doors with the right+click, releasing thw accumulated temperature. It's a cute idea The transitions were also nice and the (keyboard+mouse) controls were relatively smooth. I like that you fade out the room. I like twin stick shooters, so Im glad I played one this jam. Finishing a game jam on your first time is hard. The mage felt a bit slow, and the theme wasn't very represented, but It was a great for a first Godot project.